Winslow Homer (1836–1910), West Point, Prout's Neck (1900), oil on canvas, 76.4 × 122.2 cm, Sterling and Francine Clark Art Institute, Williamstown, MA. Wikimedia Commons. Maine, the small state tucked away at the north-east extremity of the US, is the coast to paint if you’re an East Coast landscape artist. Its climate may not be ideal for plein air work, but its coastline is one of the most beautifully rugged on the North Atlantic. It has attracted many of the major landscape artists from the eastern cities, from Thomas Cole (born in Bolton, England, and raised in Ohio) to George Bellows (born and raised in Ohio too). 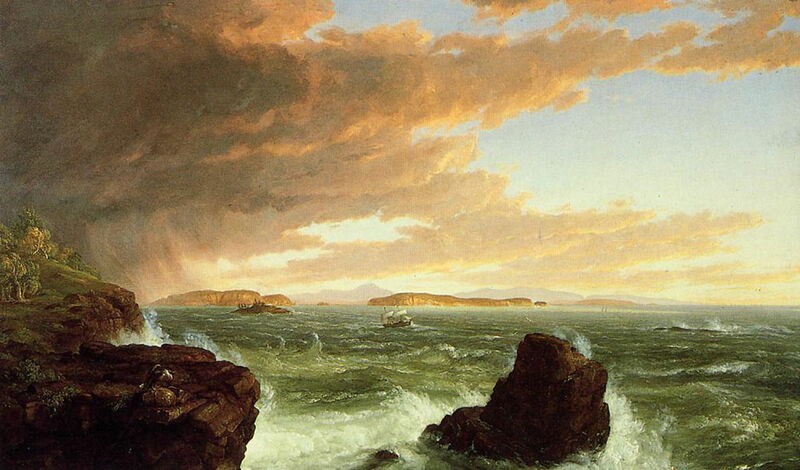 In this series of two articles, I’m going to show some of my favourite paintings of the Maine coast. This first covers those artists active in the nineteenth century, starting with Cole and ending with Winslow Homer; the second concentrates on Childe Hassam and George Bellows, with a single work by Robert Henri, largely from the twentieth century. Thomas Cole (1801–1848), View Across Frenchman’s Bay From Mt. Desert Island, After A Squall (1845), media and dimensions not known, Cincinnati Art Museum, Cincinnati, OH. Wikimedia Commons. Generally accepted as the founder of the Hudson River School, many of Thomas Cole’s landscapes were painted in the Catskill Mountains. 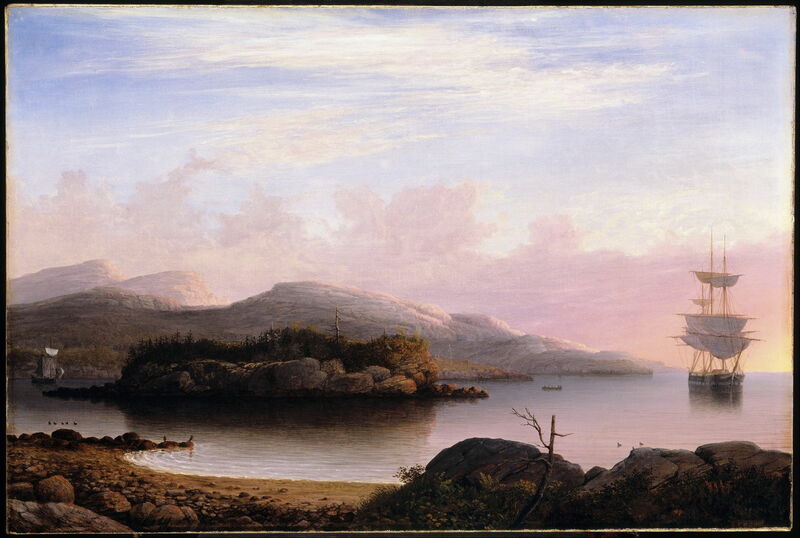 In 1845, though, he travelled to Maine, where he painted this View Across Frenchman’s Bay From Mt. Desert Island, After A Squall. This large island – it is larger than Martha’s Vineyard, for example – is part of the archipelago which stretches off the Maine coast, and now contains Acadia National Park, which is very popular with tourists. Cole shows this view as a squall is moving on, the wind and sea still showing its effects. It is likely that Frederic Edwin Church was with him there, as he was Cole’s student at the time. 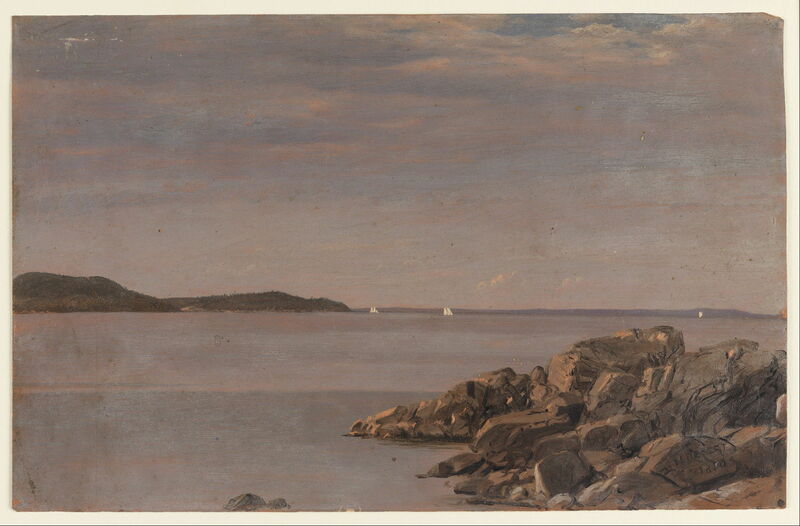 Fitz Henry Lane (1804–1865), Off Mount Desert Island (1856), oil on canvas, dimensions not known, Brooklyn Museum, New York, NY. Wikimedia Commons. Fitz Henry Lane was born in the port of Gloucester, MA, and made his career painting marine views in New England. His view Off Mount Desert Island from 1856 shows the same island in much more peaceful weather, with a ship at anchor, its sails limp in the calm. Frederic Edwin Church (1826–1900), Mt. Desert Island, Maine Coast (1850), oil on cream wove paper, Cooper Hewitt, Smithsonian Design Museum, New York, NY. Wikimedia Commons. Frederic Edwin Church was another New Englander, best known for his huge, amazingly detailed panoramic landscapes of Central and South America. He had settled in New York by 1850, and seems to have taken trips most summers to the wilds of Maine to paint en plein air in oils. He made this rather sparse view of Mt. Desert Island, Maine Coast in oils on paper in 1850. Frederic Edwin Church (1826–1900), Beacon, off Mount Desert Island (1851), oil on canvas, 116.8 × 78.7 cm, Private collection. Wikimedia Commons. 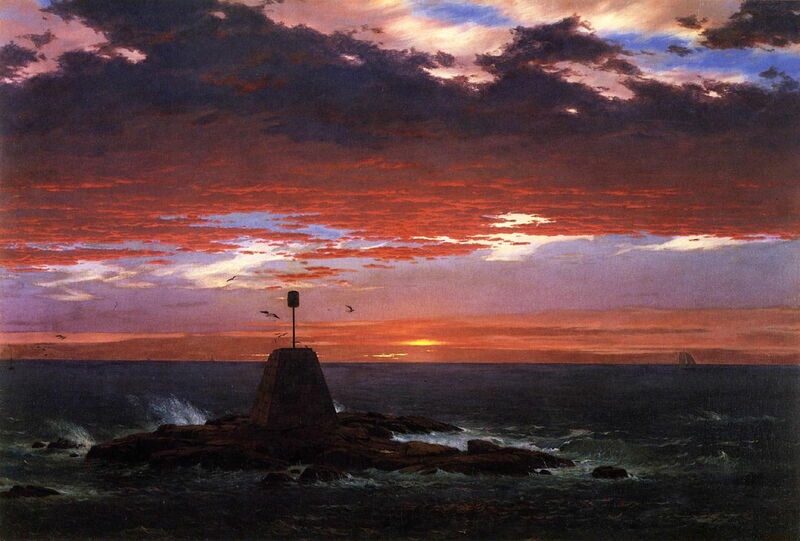 The following year, Church painting this rich twilight seascape of a Beacon, off Mount Desert Island (1851). Frederic Edwin Church (1826–1900), Schoodic Peninsula from Mount Desert at Sunrise (1850–55), oil on paperboard, 22.9 x 34.9 cm, Cooper Hewitt, Smithsonian Design Museum, New York, NY. Wikimedia Commons. Church made his first visit to South America in 1853. I’m not sure whether he painted Schoodic Peninsula from Mount Desert at Sunrise (1850–55) before or after that trip, but it contrasts with the highly detailed and complex views which he made of The Andes of Ecuador (1855), and similar later works. Frederic Edwin Church (1826–1900), Eagle Lake Viewed from Cadillac Mountain, Mount Desert Island, Maine (1850–60), oil and graphite on paperboard, 29.4 x 44.5 cm, Cooper Hewitt, Smithsonian Design Museum, New York, NY. Wikimedia Commons. 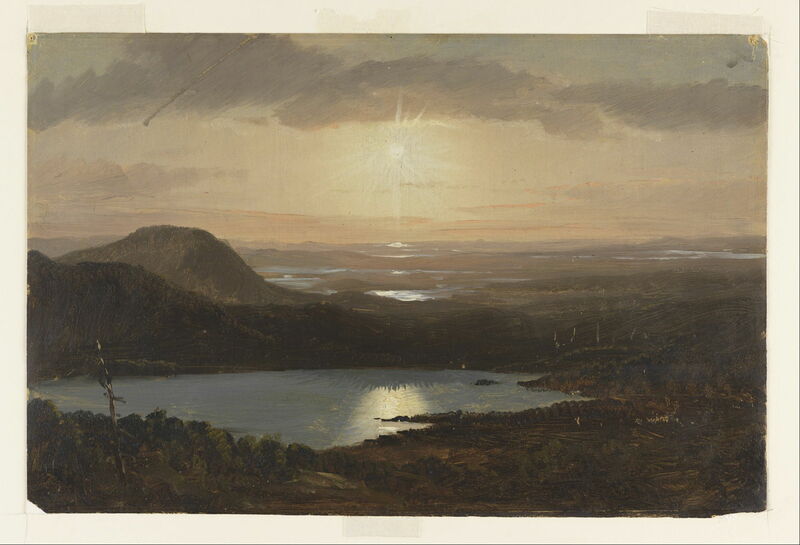 Eagle Lake Viewed from Cadillac Mountain, Mount Desert Island, Maine (1850–60) is another probably rather later painting which features a considerably more complex motif. Cadillac Mountain is relatively low, at 466 metres (1530 feet), but the highest point of Mount Desert Island, which affords spectacular views such as this. Alfred Thompson Bricher (1837–1908), On the Coast of Maine (date not known), oil on canvas, 46.4 × 99.7 cm, Private collection. Wikimedia Commons. Alfred Thompson Bricher (1837–1908) was one of the last artists of the Hudson River School, and studied with Albert Bierstadt. Born in Portsmouth, New Hampshire, many of his best works are coastal landscapes. Although he lived in Staten Island, New York, at some stage he travelled up to paint this tranquil view On the Coast of Maine. Martin Johnson Heade (1819–1904), York Harbor, Coast of Maine (1877), oil on canvas, 8.7 × 76.8 cm, Art Institute of Chicago, Chicago, IL. Wikimedia Commons. 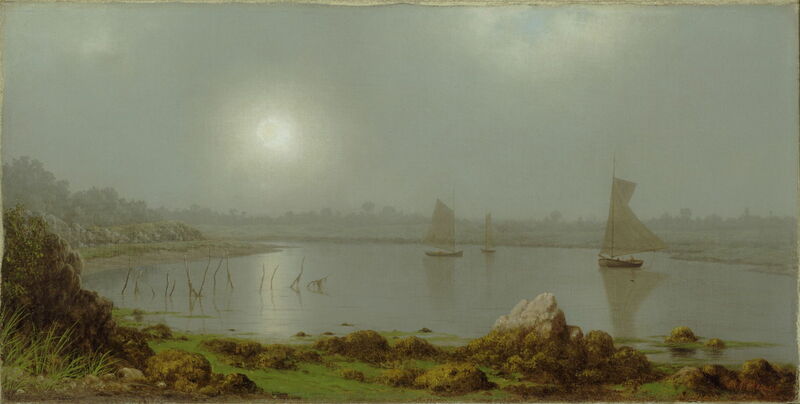 Martin Johnson Heade was a latecomer to landscape painting, but made a speciality of painting coastal salt marshes in New England, before he moved to Florida in 1883. In 1877, he seems to have made his way to the southern edge of Maine, to paint a stretch of marsh near the new tourist resort of York Harbor, Coast of Maine. This is a remarkable contrast from the rough and rocky coast further north and east. 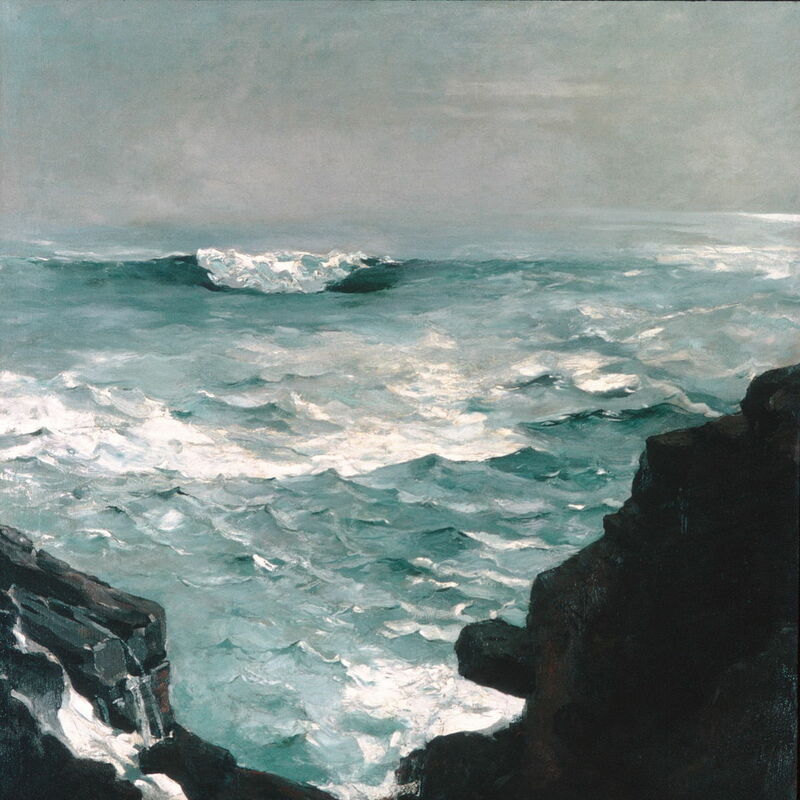 After Church, the landscape painter most strongly associated with the Maine coast was Winslow Homer. Born in Boston, his formative periods were spent on the coast. During the 1870s, he started painting in watercolour around Gloucester, Massachusetts, then spent 1881-82 developing his art further in Cullercoats, a fishing community in north-east England. Winslow Homer (1836–1910), Incoming Tide, Scarboro, Maine (1883), watercolour on paper, 38.1 × 54.8 cm, National Gallery of Art, Washington, DC. Wikimedia Commons. 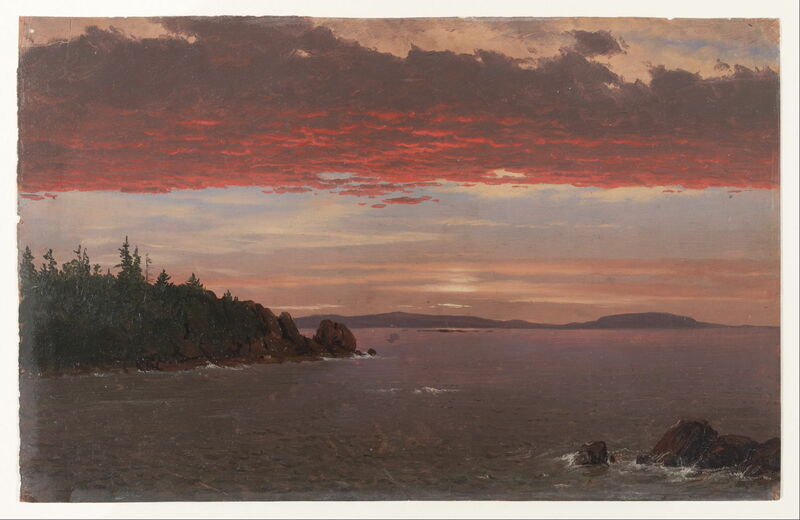 Shortly after his return from England, Winslow Homer moved to Prouts Neck, in Scarborough, Maine. This was rapidly becoming a summer seasonal resort, and Homer’s new studio was only twenty-five metres/yards from the sea, overlooking Cannon Rock. 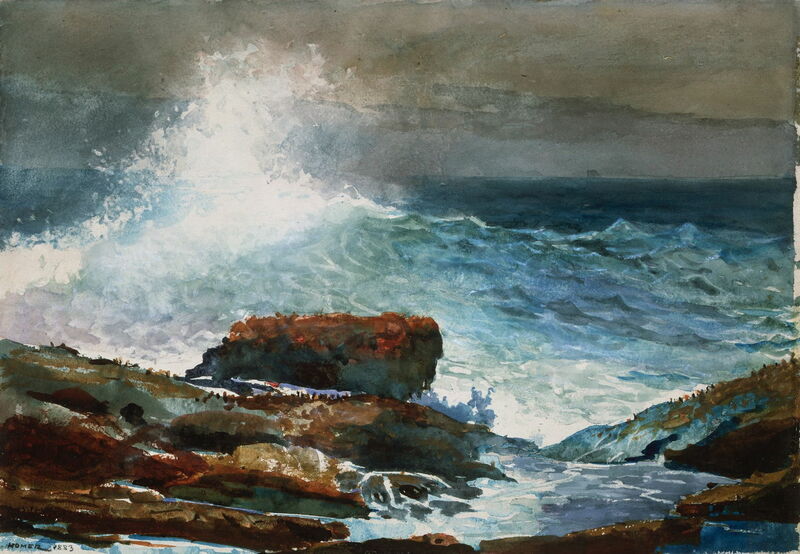 His Incoming Tide, Scarboro, Maine (1883) (above) is a typical watercolour from this period, with Breaking Storm, Coast of Maine (1894) (below) demonstrating his versatility in technique. 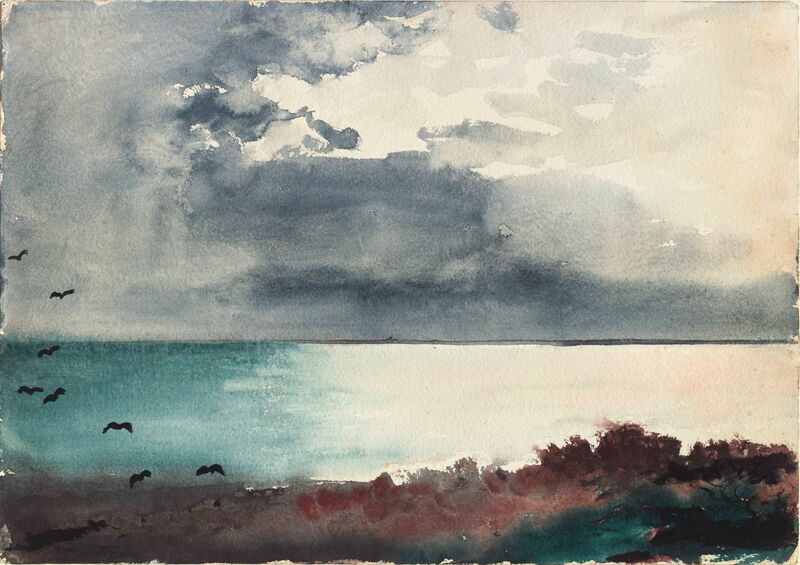 Winslow Homer (1836–1910), Breaking Storm, Coast of Maine (1894), transparent watercolour, with touches of opaque watercolour, rewetting, blotting and traces of scraping, on thick, rough-textured, ivory wove paper, 38.4 × 54.6 cm, Art Institute of Chicago, Chicago, IL. Wikimedia Commons. Winslow Homer (1836–1910), The Outlook, Maine Coast (1894), transparent watercolour, with traces of opaque watercolour, rewetting, blotting, spatter and traces of scraping, over graphite, on moderately thick, slightly textured, ivory wove paper, 35.4 × 50.5 cm, Art Institute of Chicago, Chicago, IL. Wikimedia Commons. 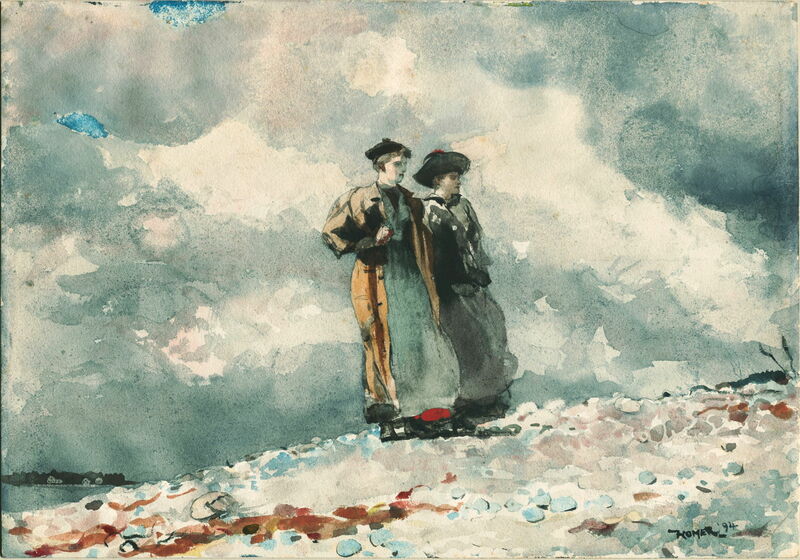 Apart from the fashions, The Outlook, Maine Coast (1894) could have been one of his superb watercolours from Cullercoats over a decade earlier. This oil painting of Cannon Rock from 1895 is more of a puzzle, though. It shows the rock just outside his studio at Prouts Neck, with which he was extremely familiar. Homer has a deserved reputation for careful realism which, at times, seems almost documentary. Yet the impressive breaker shown here could only have occurred when the tide was low; the inlet in the foreground shows that, in that part of the painting at least, the tide was high, not low. Perhaps even Winslow Homer took a little artistic licence at times. Winslow Homer (1836–1910), West Point, Prout’s Neck (1900), oil on canvas, 76.4 × 122.2 cm, Sterling and Francine Clark Art Institute, Williamstown, MA. Wikimedia Commons. 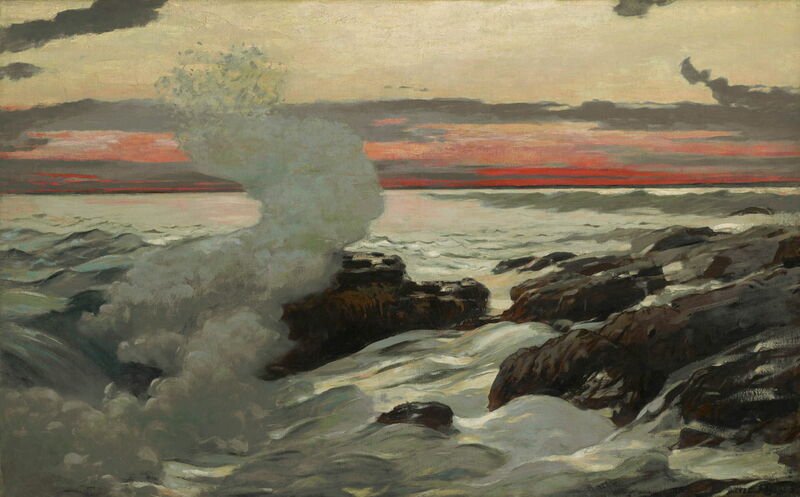 Homer’s wonderful twilight view of West Point, Prout’s Neck (1900) sees us into the twentieth century, and the new generation of artists to paint the coast of Maine. Posted in General, Life, Painting and tagged Bricher, Church, coast, Cole, Heade, Homer, landscape, Lane, painting. Bookmark the permalink. These paintings really transport one to an utterly beautiful area of the country. Yes, I’d love to visit Maine, particularly after looking at these paintings. Would it be possible to share an image of an oil painting I have with you? I’m interested in determining a better understanding of its history. Perhaps you can offer insight? Thank you. But of course – my email address is given in the About this Blog page. I’m always happy to provide advice.